Dancing Stage featuring Dream Come True is the second "Dancing Stage" title of the Dance Dance Revolution series in Japan. While the Dancing Stage moniker has been the alternative name for the Dance Dance Revolution series in the European region, a handful of DDR games in Japan also feature this title. 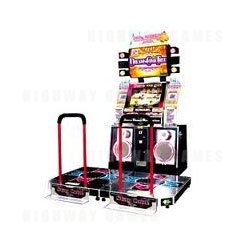 The gameplay is similar to Dance Dance Revolution and it has songs performed by the J-Pop group, Dreams Come True.